Google Drive A safe place to store all of your files. Take advantage of the powerful search tool to find your files quickly. Google Drive starts with 30GB of online storage. Upgrade your account to gain access to unlimited storage. Google Drive also allows you to store any file as it supports over 40 popular file formats. 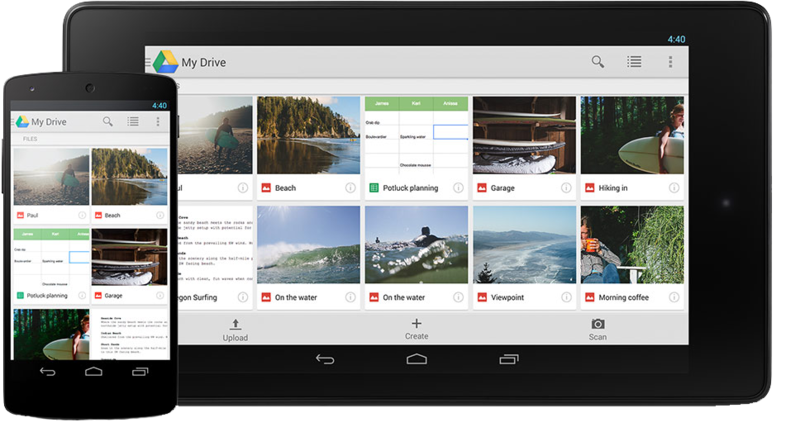 Work from anywhere at any time with powerful Google Drive applications for Android and iOS. Get the same seamless experience when working in the office or on the go. Access Google Drive from any smartphone, tablet or computer effortlessly. Google Team Drives are spaces where teams can share and collaborate on documents that are only relevant to them. Files shared in Team Drives belong to the team and not the user, allowing for teams to work better and more efficiently.